SAIC's Master of Arts (MA) in Art Therapy and Counseling program cultivates influential, compassionate leaders who are critically engaged with the social and cultural contexts surrounding artmaking and healing. 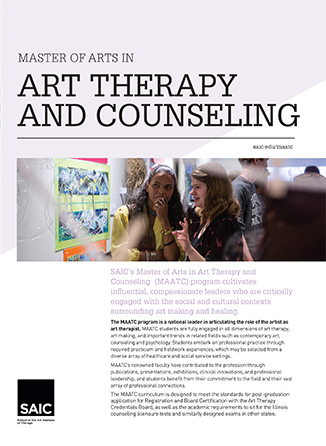 If you are ready to apply to the School of the Art Institute of Chicago's (SAIC) Master of Arts in Art Therapy and Counseling, you will need to first submit SAIC's Graduate Application form and then a corresponding ePortfolio for the Art Therapy department. ePortfolios are required for each additional program to which you wish to apply. All submissions happen via the software SlideRoom. Admission to SAIC is for the Fall term only. To prepare the strongest application possible, carefully review the Admissions Preparation & Application section of the Master of Arts in Art Therapy and Counseling Program Guide as you begin the application. Write a 500- to 700-word statement that describes the focus of your body of work and how you came to choose art therapy as the academic area you wish to pursue at the graduate level. Also discuss future directions or goals for your work and describe how the Master of Arts in Art Therapy and Counseling program is particularly suited to your professional goals. Upload your statement of purpose to the Attachments section of your ePortfolio. Your portfolio should represent your area of highest achievement in an arts profession. For example, studio-based work accompanied by descriptions; creative or scholarly writing; or documentation of art education projects in schools, museums, or community-based settings. A visual portfolio should consist of up to 20 images, or up to 10 minutes of time-based work, or a combination of the two in which one image is equivalent to approximately two minutes of time-based work. In-person interviews are required. Interview Day takes place in mid February. For applicants residing outside the United States at the time of application, please contact the department at arttherapy@saic.edu or 312.899.7481 to schedule a Skype or phone interview. A current résumé is required. Upload your résumé to the Attachments section of your ePortfolio. Include a human service summary of relevant volunteer or employment experience that lists the name of each site, the type of setting, your roles and responsibilities, dates of service, and total contact hours. This information will be entered into the Human Services form in your SlideRoom ePortfolio. Please include total hours for all human service experience. More information about the TOEFL. More information about the IELTS. An introductory art therapy course is strongly encouraged. Completion schedule: Students have a maximum of four years to complete the degree This includes time off for approved leaves of absence. Thesis in Progress: Students who have not submitted a finished thesis for review and approval by the end of the final semester of enrollment are given a Thesis in Progress grade (IP). All students with a Thesis in Progress grade (IP) will be charged the Thesis in Progress Fee in each subsequent full semester until the thesis is completed and approved and the grade is changed to Credit (CR). If the statute of limitations is reached without an approved thesis, the grade will be changed to No Credit (NCR). Transfer credits: A minimum of 48 credit hours must be completed in residence at SAIC. Up to 12 graduate transfer credits (from previous master's degrees) may be requested at the time of application for admission and are subject to approval at that time. No transfer credit will be permitted after a student is admitted. Electives: One studio elective may be taken prior to the sixth semester, including during a summer semester or winter interim, by any student wanting to complete the program in five semesters. An elective non-studio course may be substituted for one studio with the prior approval of the Department Chair. Professional Progress Review: At the end of semesters I and IV, each student participates in a Professional Progress Review (PPR). The PPR is an evaluative process used to determine the student's progress in the program. It includes a self-assessment as well as evaluation by each of the student's faculty members. Satisfactory progress in the program is necessary prior to advancing to the next phase of the MA in Art Therapy and Counseling program. Serious academic or interpersonal deficiencies may result in termination from the program. Fieldwork/Internship Requirements: As part of the MAATC internship requirement, students are obligated to meet the trainee expectations of their internship site. These requirements may include a criminal background check, drug testing, the submission of immunization records, special training, etc. Full-Time Status Minimum Requirement: 6 credit hours for fall and spring semesters, 6 credit hours in the summer. The Art Therapy and Counseling graduate program is a national leader in articulating the role of the artist and art therapist. As part of their art therapy education, students are expected to be fully engaged in the intellectual dimensions of art therapy theory, research, and philosophy, as well as important trends in related fields such as counseling and psychology. The MA in Art Therapy and Counseling curriculum is designed to meet the standards for post-graduation application for registration and board certification with the Art Therapy Credentials Board, as well as the academic requirements to sit for the Illinois counseling exams and similarly designed licensing guidelines in other states. Our faculty's combination of clinical experience and scholarly and artistic backgrounds has helped establish social service resources across the United States and around the world. They have contributed to the history of the profession through publications, presentations, exhibitions, clinical innovations, and professional leadership, and students benefit from their commitment to the field and their vast array of professional connections. Additionally, students embark upon professional practice through required fieldwork experience, which may be selected from a diverse array of healthcare and social service settings, including psychiatric facilities, residential care, schools, drug treatment centers, and correctional facilities. Exposure to the unique challenges, ethical dilemmas, and successes of their fieldwork settings—as well as the requirement to work with both children and adult populations—enriches the students' understanding of the application of art therapy in multiple contexts. Graduates become leaders in the field of art therapy in the areas of professional practice, research, and theory. The dynamic production and exploration of art is central to art therapy, and MA in Art Therapy and Counseling students' practices are profoundly shaped by their peers at one of the best art and design schools in the world. Artmaking is incorporated into every art therapy class, and students are required to take nine credits of studio coursework. Through academic and studio courses, exhibitions, and events, SAIC influences students' creative visions and offers them the opportunity to produce innovative creative projects and individualized educational initiatives.